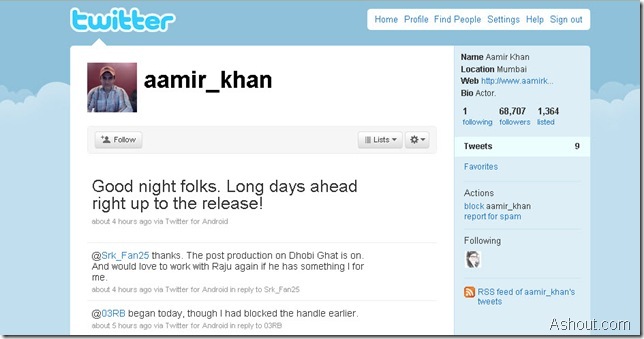 Aamir Khan is now available on Twitter! Yes, Aamir khan just joined the twitter on Jun 30th and you can now follow Aamir Khan on twitter. After few Bollywood hero’s like Amitabh Bachchan, Shah Rukh and Salman Khan and now it’s time to Aamir Khan to join twitter. Seems Bollywood is now slowly entering to micro blogging platform. Aamir Khan joined on Jun 30th, within 2 days he managed to acquire 68,707 followers and he already listed in 1,364 list. He is followed by 68,707 followers, but Aamir Khan is following only one person, that person is Amitabh Bachchan. Aamir Khan first tweet is Testing. Aamir. 12:46 PM Jun 30th via Samsung Mobile so, his first tweet is from the product what he loves. You can see Aamir Khan has not yet filled his Bio column of twitter and he is using default twitter settings itself. Maybe in future he may update his profile in twitter. If you are a fan of Aamir Khan then you can now follow him on twitter @Aamir_Khan. Thats grt to hear.. visited his website , Its funny again 🙂 3 Idiots..
my son is very weak in studies just like your film Taare Zameen Par’s isshan avastthi. sir, i will be greatfull to you if you can help me by telling me / advising me doctor for him. sir, i have taken him to the hospital & doctor also & test has also been done, counselling has been also done & according to doctors he is normal but then too he is very weak in studies, does not writtes proparly, does not learns proparly & his school performance is very bad. he brings zero marks. sir, hopefully you will understand our problem & help us. mr.aamir khan i’m ur big fan.mai akbar apse milna chate hoon lakin mai kolkata mai rahti hoon apse nai mil paugi.aamir sir i luv u verrrrrrrrrrrry mucccccch.